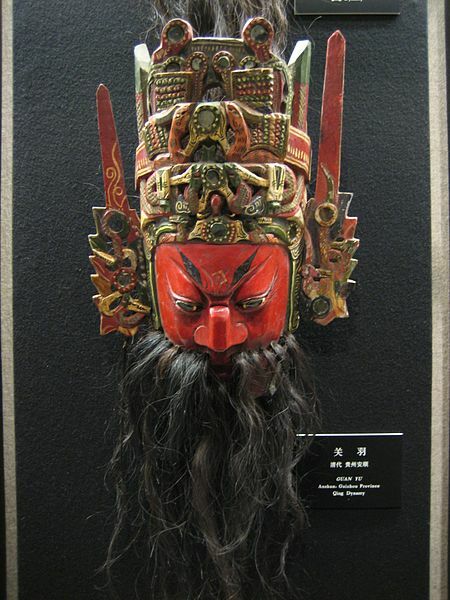 Guan Yu Mask, Qing Dyansty. Guan Yu was a favorite deity of the Red Spear movement. Source: Wikimedia. The Red Spears are a forgotten moment within the modern history of the Chinese martial arts. Reading the accounts of these groups and contemplating their relationship with larger social forces, one cannot help but suspect that this is not a coincidence. This anonymity has nothing to do with the size or social importance of the movement. Both Elizabeth Perry and Tai Hsuan-chih note that by the end of the 1920s there may have been three million Red Spear boxers in Henan province alone, and many more in the surrounding region. Shandong likely had over one million members within its boarder. Given the vast numbers of individuals who received regular training in these groups, and their actual involvement in a variety of types of social violence, one would assume that the Red Spears might have left an important mark on how the martial arts are remembered and viewed today. It is hard to think of many folk styles that could have boasted of such large membership numbers, or ended up in militarized disputes with so many other actors. Yet this is not the case. As with any complex phenomenon we can probably point to a number of reasons why the Red Spears have slipped into obscurity. In an age of growing national consciousness they waged violent conflicts to promote only regional and parochial interests. Neither the Nationalists or the Communists succeeded in their attempts to drag the Red Spears onto the stage of modern nation building. Simply put, victors do not have much of an incentive to remember the struggles of losing forces, especially when those elements seem to have been fighting directly against the tide of “national progress.” In the words of Ernest Renan, a nation is forged both by what we collective choose to remember about our past, and by what we agree to forget. In purely theoretical terms I suspect that this is a sound explanation. Still, one cannot shake the feeling that deeper and more emotional forces are invoked in any discussion of the Red Spears. After all, this group was not simply a village militia or a martial arts movement (though it did contain elements of both of these things). Rather, the Red Spear system was based on a complex set of heterodox religious rituals. It is one thing to adopt the detached language of the social sciences and note that most of these rituals were basically an extension of local religious practices and therefore understandable. Yet it still surprising to realize that as late as the 1940s there were millions of martial artists in China actively fighting the (very modern) Japanese army armed with a motley assortment of captured and homemade weapons, some Kung Fu training, and a seemingly unshakable faith in the ability of their magical charms to block up the barrels of enemy artillery pieces. Indeed, the very existence of the Red Spear movement seems to be an affront to the idea of modernization. In an era when China was becoming a “rational state” crisscrossed with railroads and telephone lines, we see peasant soldiers taking to the battlefield with a firm belief in their own magically bestowed invulnerability. Nor were any of these individuals ignorant as to how exactly guns worked. After all, larger numbers of firearms had been in use in northern China since the Taiping and Nian Rebellions, and bandits in the countryside were managing to inflict a great deal of destruction with modern rifles. The Red Spear movement just plays too easily into the comfortable stereotypes of “backwards and superstitious” peasants. The undeniable effectiveness of these groups in protecting their communities and standing up to much larger and more effective forces (including the Nationalists, the Communists and the Japanese) paradoxically makes the situation even worse. The dominant ideology of these groups, and most western scholars, is that technology always overcomes backwardness. The light of science dispels superstition. This narrative defines our notions of “progress.” The sudden victory of the traditional over the “inevitable forces of modernity” left many commentators struggling to explain what it all meant. Is it any wonder that only a handful of scholars have written on the Red Spears, or that they have played so little part in the creation of our modern understanding of (and debates about) the Chinese martial arts? This is unfortunate for a number of reasons. When we neglect the story of the Red Spears we leave a notable void in the modern history of Chinese hand combat. It is also a problem as their narrative speaks directly to some of the key issues in Chinese martial studies today. Consider the debate about the role of spirituality or religion in the origins of the martial arts. The sudden spread of a massive Kung Fu cult across northern China in the 1920s (in an area where such practices had not previously dominated the martial arts) would seem to be relevant to this discussion. The rapid creation, support and spread of these groups also have important implications for our understanding of the relationship between martial arts associations and various social elites and institutions. Given the inherent unpredictability of these practices, under what conditions will community leaders be willing to support the creation of quasi-militarized societies? And to what ends? Understanding the ritual basis of the Red Spear movement will allow us to begin to address these larger issues. The current post introduces a number of possible theories that might help us to make sense of the (admittedly diverse) religious practices of these groups. It will then draw on the works of Elizabeth Perry and Tai Hsuan-chih to provide a basic outline of what Red Spear ritual and indoctrination was like as well as a limited discussion of how these beliefs appear to have functioned on the battlefield. I then conclude that functionalist explanations of these rituals, focusing on their role in community building, are more likely to shed light on the reality of the Red Spears than attempts to explain these innovations away as yet one more revival of peasant superstition. Any discussion of ritual or magical practices among the Red Spears must begin by framing the actual puzzle facing historical or cultural researchers. The areas of China where the Red Spears were most active (e.g., Henan and Shandong Province) had long histories of peasant uprisings and banditry. Martial arts training was a widespread reality of life among middle and poor peasants in the countryside. Yet most of these practices did not rely on spirit possession, invulnerability charms or the adoption of a new religious cult. To be sure all of these more esoteric technologies could be seen among certain groups in the countryside. Esherick has done important work in both documenting the presence of these practices, but also contextualizing them as a minority approach to the martial arts during the late 19th century. After the Boxer Rebellion such groups appear to have become discredited and deeply unpopular. So how exactly did these elements come to dominate life within the Red Spears militias of the 1920s-1940s? For the most part this was not the continuation of an ancient regional tradition, but the conscious importation of a new set of practices by local elites which were different from many preexisting martial arts traditions. Nor can we simply conclude that these rituals were somehow socially necessary to create a militia. The late Qing was full of local defense societies, and most of them never relied on heterodox cults or beliefs about invulnerability. In purely military terms, training one’s soldiers to believe that they are actually invulnerable (and thus have no need of taking cover when they come under fire) has certain inherent limitations. Of course readers should also recall that this was not the first time that such groups had risen to prominence in the region. Perry noted that the “Old Cow” defensive societies of the Nian Rebellion shared many of the same heterodox practices. While distinct in some important ways, these associations were similar to the Red Spears in that they were community (rather than lineage) based structures which were backed by local landlords. The exact significance of these correlations will require further consideration. Perhaps the most obvious strategy to explain the sudden rise of the Red Spears is to simply deny that there was really anything unique about these events. Perhaps local history or geographic determinism is the correct answer. This movement may be nothing more than a specific manifestation of the timeless pattern of perilous peasant life within Northern China’s bandit infested and flood prone regions. At times Tai Hsuan-chih seems to come close to this attitude. Initially he argues that the Red Spears are a continuation of village militia structures, first codified in the late imperial period. Indeed, Tai deserves much credit for placing the topic of rural militias squarely at the center of academic discussions of the political economy of violence within Chinese society. Still, given the numerous differences between the various heterodox groups which have appeared in the region (the White Lotus, the Yihi Boxers and the Red Spears to name just a few), it is odd to see him continually equate these movements with each other and even draw direct lines of causality between them. Questions of institutional innovation aside, one suspects that Tai perceives within all of these groups a common cultural element shared by the many rural villages of northern China. This then becomes conflated with his many comments which seem to actually disparage the sophistication and intelligence of the peasant communities that he seeks to study. This tendency in his work has been noted by a number of readers and critics. Even Ronald Suleski, who translated and promoted his work in English, felt compelled to distance himself from that aspect of Tai’s writing. The problem with locating the roots of these behaviors within the region’s “ancient past” is that it actually fails to advance any explanation at all. It simply punts the question to another era allowing the most interesting aspects of this story to be treated as exogenous events. Elizabeth Perry addresses a number of different possible explanations for the rise of the Red Spear movement in her works. One of these theories in particular caught my attention, not because it was ultimately the strongest, but as I suspect that it will be shared by readers learning about this group for the first time. Perry notes that a belief in invulnerability and a retreat into socially conservative modes of magical practice are by no means isolated to the Chinese peasantry. These sorts of behaviors have been observed within a number of settings, from cargo cults to revitalization movements, as traditional societies suffer psychological shocks following disruptive exposures to modernity. Such an approach is more useful than the previous theory as it acknowledges that the sudden rise of new institutions within the countryside is a puzzle to be explored rather than a cultural continuity to be explained away. Still, one has to wonder whether this particular application of the “culture shock” theory gets the timing right. Contact with western ideas, technologies and even individuals were daily occurrences in the 1920-1940. Railroads and telegraph lines had become a part of life. Earlier uprisings (most specifically the Yihi Boxer movement from 1898-1900) had been extremely anti-western and anti-Christian in their orientation. Yet both Perry and Tai (as well as numerous contemporary observes) point out that the Red Spears had no obvious anti-foreign bias. Their aims were really too regional for this. They were focused almost solely on the questions of local banditry and tax collection. As such the Red Spears were much more likely to come into conflict with their own government than foreign ones (the Japanese invasion of northern China being the obvious exception). One of the issues that we have when discussing the Red Spears is that this was far from a unified movement. Indeed every town had its own chapter of a more specific sect which was basically run by the local landlords and social elites. As such it is dangerous to make sweeping generalizations about the movement. Still, it appears that the Red Spears bore no special animus to foreign products or individuals. It did not harass missionaries and would cooperate with them on disaster relief efforts. Perry even notes local policies in some areas excusing Chinese-Christians from the standard forms of ritual worship expected of Red Spear members on the condition that they performed similar rites to their own God and the 10 Commandments upon joining the group. We have no evidence of how widespread such tolerance actually was. Yet when taken together it is difficult to conclude that the Red Spears formed as reaction to “culture shock” or some other anti-modernist impulse. The overriding impression that one receives after reading the accounts of these groups is that such issues were not all that important. Their attention was totally consumed by other more pressing problems in the form of pervasive banditry and dysfunctional local government. A third school of thought might suggest that we shift our focus from the question of how the Red Spears first emerged to the more “functionalist” puzzle of how their religious ritual actually operated within these communities. Questions of origin are actually not that interesting as we already know that similar practices could be found within local religious traditions. As such, the potential for new institutions built on these rituals was always there. But how did this latent potential spread so quickly across the countryside, and how did it remain stable for roughly two decades of intensive civil and international conflict? To address these issues we will have to think about the sorts of social functions within the community that Red Spear rituals performed. It could be that the ultimate origins of the Red Spear movement are simply “path dependent” and therefore not really amenable to rational analysis. While groups like this had always been present, they generally did not take center stage. Perry notes that in the 1910s a local Red Spear Society had some success in hunting down a large group of particularly aggressive bandits. Individuals who were familiar with the case then began to invite Red Spear teachers to their own village. In any event, the relationship between the religious rituals of the Red Spears and their actual success as a militia was in no way random. A functionalist approach to this problem would point out (following Perry) that while many bandit groups were dominated by lineage structures, the sorts of defensive efforts needed to secure the countryside could only be implemented by entire communities working together. Hence protective organizations were almost always community based while predatory ones tended to replicate clan structures. Unfortunately encouraging cooperative action within a community is never easy. Actors face a number of problems including the “collective action dilemma” (where everyone would prefer that their neighbors contribute to the common good while they are allowed to shirk their responsibility). Overcoming this impulse in a clan based society is never easy. It is even more challenging when we consider what decades of flood, famine, migration, banditry and warlordism had done to the structure of these communities. In such a situation strengthening and redefining the community’s basic identity would be an important precondition to addressing any of the organizational dilemmas necessary to ensure the protection of local property holdings. Obviously elites and large landlords would have both the resources and proper incentives to overcome these hurdles. Yet how does one go about creating a sense of community? From Durkheim onward we have known that the definition of the sacred is deeply bound up with the maintenance of the social. In fact, the same basic insight can be seen in Chinese religious thought. A community is by definition a group of people who worship and offer sacrifices together. This helps to explain how a new, entirely neutral, set of rituals would be a valuable first step in forging a strong community capable of standing up to considerable challenges. If this new set of religious rituals also promised martial prowess, and its shrines involved no elaborate holidays or new temples, so much the better. Local elites would have many reasons to support such groups that had nothing to do with their beliefs about invulnerability charms. Baba Takeshi (1976), a Japanese historian who has written on the Red Spears, supports the notion that the rituals of the movement succeeded not because the peasants were particularly superstitious, but because they created a powerful social glue which reshaped communities and held them together in the face of daunting threats. The Red Spears won on the battle field because of their greater morale. Nor can we attribute all of this to their beliefs in the supernatural. The social ramifications of their ritual system went well beyond that, and it is not surprising that these institutions quickly spread through the countryside. Baba notes that this sort of explanation solves another dilemma about the Red Spears. It is all too easy to assume that invulnerability rituals were adopted only as a means to compensate for the inferior weapons and training as these groups. Yet as the period of the Red Spears progressed, these organizations succeeded in capturing large numbers of modern rifles and ammunition. In his view this change in weaponry and tactics had no discernible impact on the practices of the Red Spear groups. Baba thus concludes that the real strength of these rituals lay in the realm of community organization and discipline rather than superstition or psychological compensation. 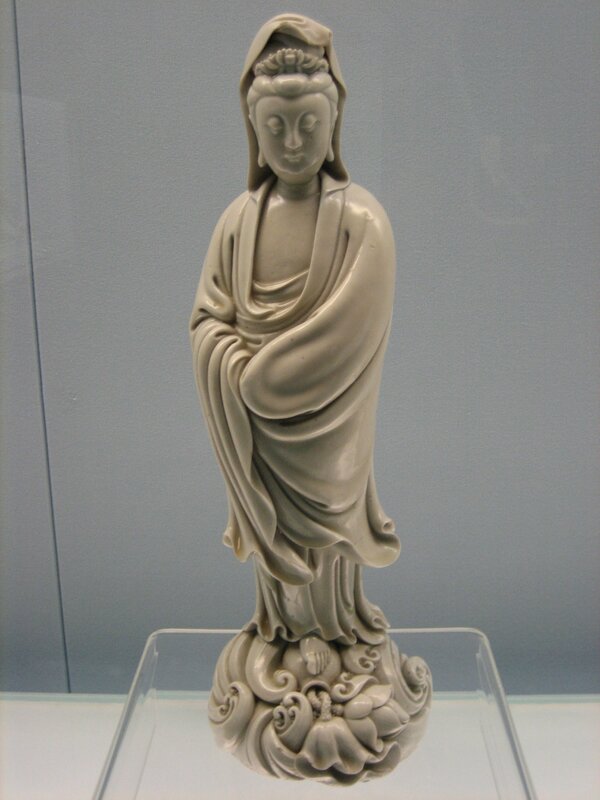 A fine Ming dynasty statue of Guanyin. This deity was popular among both sailors and pirates during the Qing period and later came to be worshiped by some Red Spear groups. Source: Wikimedia. The highly fractious nature of the Red Spears makes it difficult to generalize about the ritual practices of these groups. Both Perry and Tai note that there was enough overlap in the rituals of many of these organizations to allow us to speak of a general “Red Spear pattern.” Still, their reconstructions likely pay insufficient attention to important regional and temporal variations. Rectifying this situation goes well beyond what can be accomplished in a single blog post. One suspects that such a project would require a scholarly monograph of its own. In the remainder of this essay I will instead highlight a number of accounts of Red Spear initiations, training practices and movements in the field in an attempt to familiarize readers with the range of behaviors that might be seen in these groups. It seems that Red Spear activity usually began when a landlord or clan elder invited a teacher to open a training or worship hall (tong) in the village. Perry notes that such a proposition was not expensive as these teachers worked for room and board and usually established their simple altars in a clan temple or possibly a school. Initially each property owning family in the village (including those of wealthy peasants) would be required to send a single son to join the new Red Spear unit. After that, individuals wishing to join often needed the recommendation of two existing members. In all cases reported by our Perry and Tai, property ownership seems to have been a prerequisite of activity in the group. It should also be noted that only males were eligible for membership in these chapters. Female auxiliary associations (which played an important role in the White Lotus and Boxer movements) were not seen in this case. Baba and other historians have speculated as to what the possible significance of this might be. The first act of a new Red Spear chapter was to initiate its members into the sect’s specific religious rituals. Each of the many lineages that comprised the broader movement had their own rituals to establish relationships with one or more sponsoring deities. These were drawn from a wide variety of sources and included local folk deities, Guan Yu, Xuan Wu (Dark Warrior), Guanyin (the Goddess of Mercy), Lao Tzu, Confucius and even characters from novels such as the Romance of the Three Kingdoms. Bandit figures (such as individuals from Water Margin), sometime worshiped by other militant groups, are notable by their absence. Initiation ceremonies began with an oath of absolute loyalty to the group’s teacher. These were taken quite seriously. This was followed by one hundred or more kowtows and the reading of a set of regulations or rules. Incense and prayers would be offered, at which point the teacher would instruct new members in certain basic incantations (usually associated with invulnerability) and offer them magical talisman written on paper. These were burned and their ashes mixed with water before being swallowed. Following this introduction, new students would embark on a protracted period of training. The length and exact content of this process could vary considerably from place to place and depending on the local tactical situation. In general the training of a new member took at least 3-4 weeks, and in some cases it could last for up to four months. The training was intensive, happening multiple times a week and in many cases daily. During this period new members were expected to observe a number of ritual taboos having to do with both their thoughts, actions and diets. Certain foods (shrimp, beef, etc…) were generally forbidden, as was any sexual contact, for the duration of the training. Failures of magical practices were often attributed to the violation of these taboos. Initial training often happened in a vacant field or other isolated area, away from prying eyes. Teachers went to some length to ensure the secrecy of their charms and instructional methods, as well as to avoid possible sources of ritual pollution (including female spectators). If the training session happened outdoors a table and altar would be set up. Once again the instructor would wash his hands, burn incense and pray in front of the assembled students. They would be offered another round of talisman to burn and ingest before the start of training. The initial phase of Red Spear practice seems to have focused on what martial artists currently think of as “hard qigong.” The first exercise that students were expected to master was having a number of bricks placed on their heads and smashed by their teachers without showing any hint of pain. Those who cried out or were injured were instructed to purify their thoughts and actions before going on. The teacher then approached more advanced students. These individuals would bare their chests and arms. The instructor would slash at them with a knife or sword as they used their newly acquired magical skills and incantations to avoid harm. Again, those who suffered actual cuts were forbidden from progressing to the next level until they purified themselves. Those who showed only minimal marking passed on. The final stage of classical Red Spear initiation involved subjecting students to rifle or cannon fire. In most cases it appears that old black powder muskets loaded with relatively inefficient powder (rather than modern Mauser rifles) were used. All things considered its remarkable that more people didn’t die during these exercises. Still, they were risky endeavors and there were fatalities. Perry notes one case where a mob beat a Red Spear teacher to death after ten of his students were killed in a training exercise gone wrong. Perry states that as these practices spread from their initial base in Shandong this last stage of training was sometime dropped in favor of other more esoteric exercises. In some areas new initiates would engage in “night kneeling.” This involved being led to a deserted field or other location and being forced to kneel for up to three hours at a time every night for several weeks. After passing through this test students would be expected to submit themselves to a severe beating without showing any signs of pain or lasting injury. Following this initial phase of training students would then go on to study additional subjects. These included more mundane forms of fighting focusing on spear work and sword routines. In his monograph Tai recalls watching the local chapter of the Yellow Spear society practicing their sword forms on a daily basis in the clan temple. Additional esoteric knowledge was often imparted to students. They might be given a cloth charm to keep on their person as an aid to invulnerability. Members of the Red Spears were also required to memorize between 100 and 300 additional charms, incantations and rituals. A number of these focused on the healing arts, while others worked through more mysterious means. Esherick and Cohen have both detailed magical practices intended to prevent enemy guns from firing during the period of the Boxer Uprising. Perry’s account of the Red Spears makes it clear that some of these charms were still in practice. Consider the following story related by a Nationalist soldier who witnessed Red Spear maneuvers against the invading Japanese in northern Anhui Province during 1938. “As one of their teachers was in the middle of his talk, suddenly the sound of enemy planes could be heard overhead. Hearing the noise the peasants showed signs of discomfort. However one of their chiefs immediately jumped on the speaker’s platform yelling “Holy Water! Holy Water!” Someone who had already been stationed in front of the platform with a bucket of drinking water now knelt down and offered a bowl of water to the chief. Simultaneously, a representative from each of the dozen or so chapters rushed forward to take a bowl back to his respective group. Under instruction from the chief, each person drank a sip of “Holy Water.” Then all three to four thousand of them knelt, closed their eyes, and began to mumble their magical phrases. When the incantation was over, thy jumped up as if awakening from a dream. Their breathing was forced, their eyes bloodshot, their gaze unswerving, and their muscles tense—as though gripped by madness. The silence was deafening. Each member grasped his red-tasseled spear planted firmly like a tree. The light breeze set the tassels to fluttering, creating an even more awesome spectacle. Fortunately the enemy planes seem to have had some other destination in mind. Nine in a row, they flew off towards the northeast in apparent oblivion to the red glow beneath. The danger over, one of the teachers happily explained that they had been chanting a “block hole charm” which had worked to stop up the barrels of the Japanese guns, ensuring that no bullets could shoot forth.” (Perry 192-193). Numerous eye witness accounts attest to the centrality of invulnerability practices and charms similar to the one above within the Red Spear movement. When combined with long periods of more mundane training these served to increase the morale of local defensive units against a variety of opponents (including those who could field an air force). There is less agreement on the prevalence and interpretation of other sorts of esoteric practices. Both Perry and Tai note that certain period sources indicate that spirit possession was practiced within the Red Spear movement. How they frame this fact differs in subtle but important ways. Tai’s reconstruction of the Red Spear milieu places more emphasis on these somewhat shamanistic technologies. He also draws broad parallels between the practice of spirit possession among the Red Spears and the techniques of ecstasy practiced by Shandong’s Yihi Boxers between 1899-1900. Perry also relates accounts of spirit possession, yet these practices play a far smaller, one might say ancillary, role in her reconstruction of the movement. 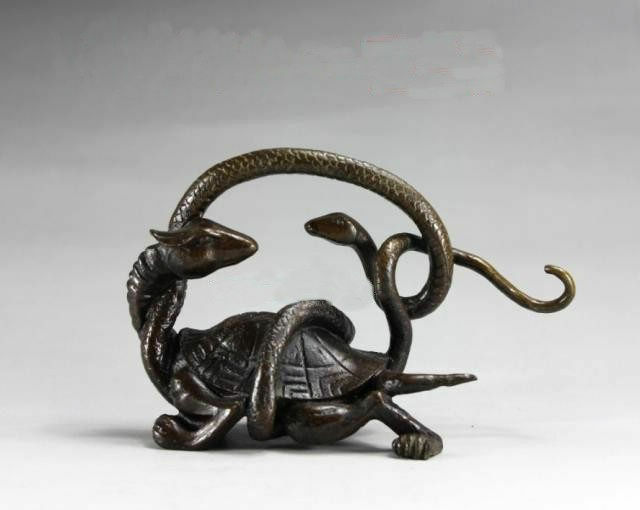 Certain groups did attribute their invulnerability to possession by various deities, yet it is clear that the vast majority of village associations relied on magical talisman to accomplish the same ends. The nature and role of spirit possession with the Red Spear movement is also important as it may shed light on some of the theoretical questions discussed in this essay’s introduction. Specifically, how did this movement relate to other social actors and in what ways are these relationships reinforced by the group’s ritual practices? In his discussion of the Boxer Uprising Esherick notes that the different esoteric technologies of the Big Sword and Yihi associations had a critical effect on the social characters of these groups. Like the Red Spears, the earlier Big Swords were backed by local landlords. They too attempted to use the hierarchically taught and disseminated rituals of invulnerability to craft a conservative community defense force. The contrast with the Yihi Boxers could not have been more pointed. This later group depended on a freewheeling ecstatic technology to induce spirit possession and invulnerability. Boxers would gather in public places and could learn the basic practices of spirit possession in only a few days. After that individual boxers were free to call on any deity that they chose. The Yihi movement assumed its wild-fire form precisely because this spirit technology was open to anyone and it tended to attract the marginal, landless and the very young. The sorts of spirit possession reported by Perry lack the socially horizontal elements which defined the Yihi movement. Rather than being something that was open to anyone, it appears that Red Spears teachers maintained control over this process. In most chapters they were the ones who might seek spirit possession as a form of revelation when settling a dispute. Even in those instances in which spirit possession was used to grant fighters invulnerability, Perry’s accounts suggest that it was still the teacher who had to invoke the God and then send its essence into the student. While spirit possession did occur within the Red Spear movement, it was never the leveling force that it became during the Boxer Uprising. Instead the teachers and leaders of the various chapters acted as gatekeepers, further reinforcing the hierarchic, and distinctly conservative, nature of the Red Spear society. It was probably this high degree of predictability and control that allowed local elites to call on the services of Red Spear teachers in the first place. 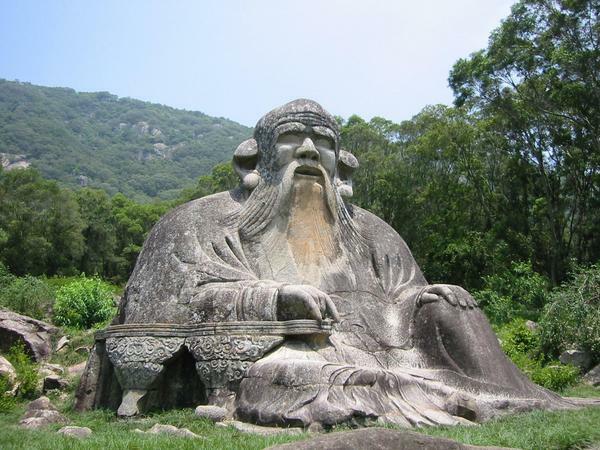 A stone sculpture of Laozi, located north of Quanzhou at the foot of Mount Qingyuan. Another figure who came to be venerated by the Red Spear Movement. Source: Wikimedia. Ritual was a vital part of life within the Red Spear movement. Daily training sessions began not only with the burning of incense and prayers, but also the ingestion of magical talisman and the chanting of incantations. Hard qigong practices were cultivated as an embodied testimony of the efficacy of this cult. The many taboos that surrounded practitioners insured that most instances of failure could be easily explained. The degree of faith created by these invulnerability rituals (still being practiced during the 1940s) confounded the expectations of the Nationalists, Communist and the Japanese. There can be no doubt that the ritual practices of the Red Spears helped to give these otherwise embattled militias a distinct psychological advantage. Yet superstition and morale do not tell the entire story. As Perry and Baba have both noted, even after Red Spear units acquired modern weaponry they continued to respect their rituals. Nor can we attribute this to a sudden case of culture shock or some timeless pattern. The generation that took up the Red Spear movement was actually much more likely to practice some form of esoteric battle magic than either their parents or grandparent. In this case the arrows of history seem to be running in the wrong direction for an easy application of the modernization hypothesis. To understand the rapid spread of these ritual practices, and the fact that they were usually invited into a village by elites who were not likely to actually practice or believe them, we must begin with the central problem that was actually facing much of northern China during the 1920s. After decades of natural disaster, banditry and warlordism local society was starting to fray at the edges. Even the once powerful clan organizations were losing clout. The establishment of a stronger group identity was the prerequisite for any form of effective community defense. This is where the rituals of the Red Spear movement came into their own. These groups created a strong sense of purpose, belonging and unity that stretched across many of the class and clan lines that divided local communities. Relatively high rates of land ownership also insured that most peasant families had at least one member who fought with the Red Spears. As such everyone in the community had an immediate incentive to support the organization. While the rituals of the Red Spears stiffened the resolve of soldiers on the battlefield, the movement probably thrived for as long as it did because it also provided a powerful set of tools for strengthening community identity. If you enjoyed this you might also want to read: The Political Economy of Southern Kung Fu: Thoughts on the Rise of Regional Identity within the Chinese Martial Arts. Would this be the same Red Spear group that Chen Fake, of taijiquan fame, had confrontations with? Chenjiaguo is in Henan so it would make sense. Hi Allan, sorry to be late in responding to this. I am not an expert in Chen Fake’s history so I can’t speak to the actual accuracy of these accounts, but yeah, this is the same “Red Spear” movement that he is said to have encountered. There was always a lot of feuding and resource competition between villages and it was quite common for the various martial arts and militias societies to get caught up in that (in fact it was one of the reasons why these groups were encouraged and supported by local elites). The Red Spears clashed with a number of other societies and martial arts groups in northern China.